Did you know that during WWII there was an adviser to Churchill who organized a group of people who dropped what they were doing every day at a prescribed hour for one minute to collectively pray for the safety of England, for its people and for peace? There is now a group of people organizing the same thing here in America. 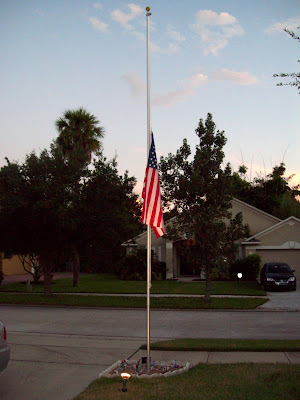 If you would like to participate: Every evening at 9:00 PM Eastern Time (8:00 PM Central) (7:00 PM Mountain) (6:00 PM Pacific), stop whatever you are doing and spend one minute praying for the safety of the United States, our troops, our citizens, and for a return to a Godly nation. If you know others who would like to participate, please pass this along. Our prayers are the most powerful asset we have. Please forward this to your praying friends. You don't have to sign on, or sign up - just pray, and ask your friends to join you in prayer. Tonight OS91 Founder Ed Ganster was invited to be the special guest on the American Adversaries Radio Broadcast to promote Operation Safety 91's 4th Annual Tribute to Honor America's 1st Responders coming up this Friday, September 30th at the Rosen Centre Hotel. Friends of OS91, Radio Hosts Lar Adams, Chris Hart and NostraDennis warmly welcomed us and helped promote not only the 4th Annual Tribute Event but also the UNO's DoughRaiser going on here in Central Florida until October 9 . 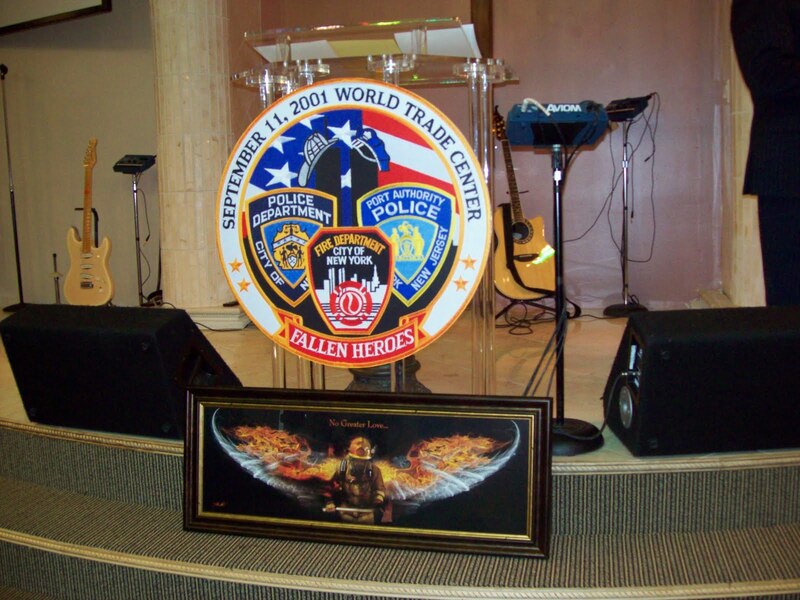 Both Events are Fundraisers for OS91 to raise monies for plastic, credit card size Psalm 91 cards for Responders. In only 8 months by God's grace OS91 has produced and distributed 200,000 plastic Psalm 91 cards all over the U.S. as well as Kuwait, Iraq and Afghanistan, and Southern Africa! A retired Firefighter called in to be part of the show and then called OS91 afterwards to put in his RSVP for the 4th Annual Tribute! 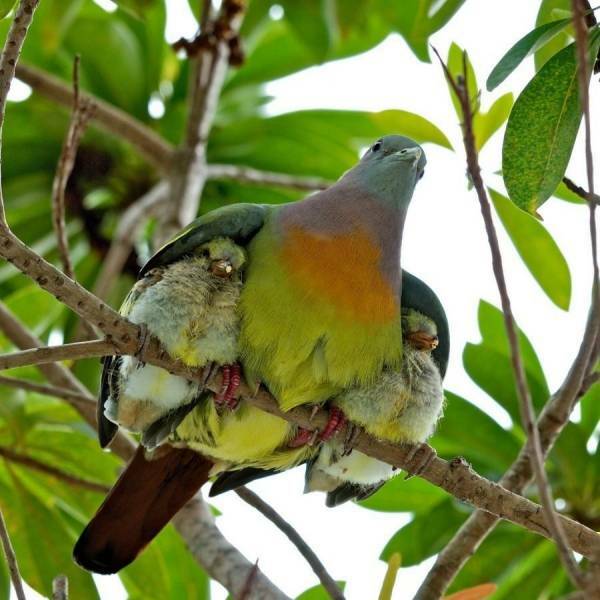 A heartfelt Thank you to Lar, Chris and Dennis for your friendship and support and God bless you for what you are doing! UNO's participating NY locations to be announced!!! 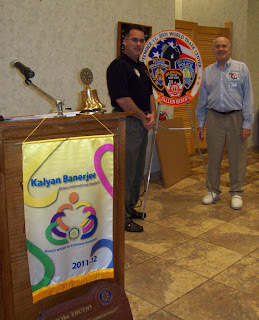 Today Ed and Mary Ganster of Operation Safety 91, guests of Dr. Paul Gordon, Pastor of First Baptist Church of Apopka, made a presentation before the Rotary Club of Apopka. As always, free Psalm 91 books and cards were made available to all and an invitation was given to all to attend the 4th Annual Tribute to Honor America's 1st Responders. 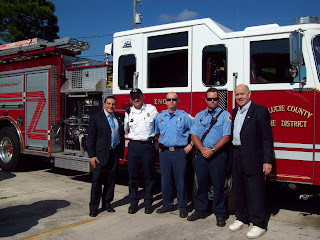 Thank you Pastor Gordon and Bill Spiegel for welcoming Operation Safety 91! 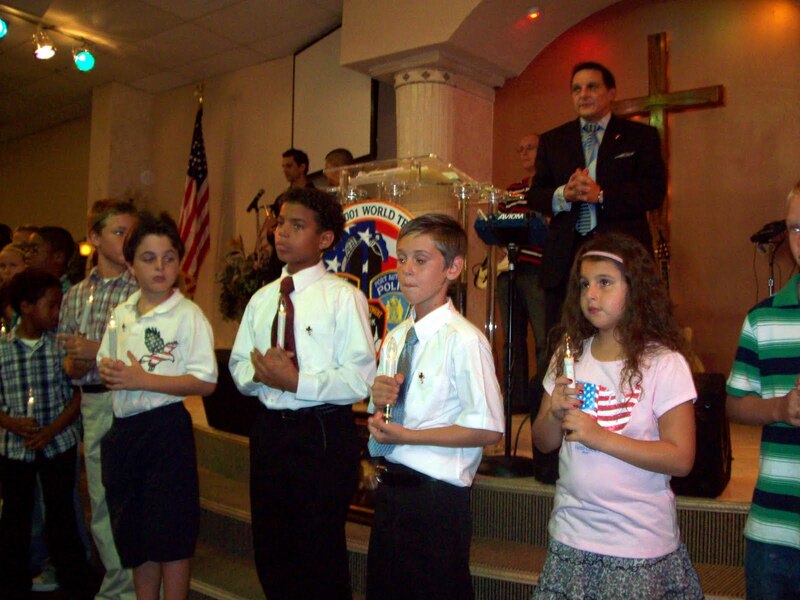 Pastors Gerry and Donnelyn Khourie of Port St. Lucie's Christ Family International Church hosted Ed and Mary Ganster of Operation Safety 91 to hold 9/11 Commemorative Services today. Special honored guests were Captain Johnson and 4 Firefighters of Engine 3 Port St. Lucie County who did not receive any Emergency calls and were able not only to stay for the entire 10 o'clock Service but even helped take down the 8' x 12' U.S. Flag after the Service. 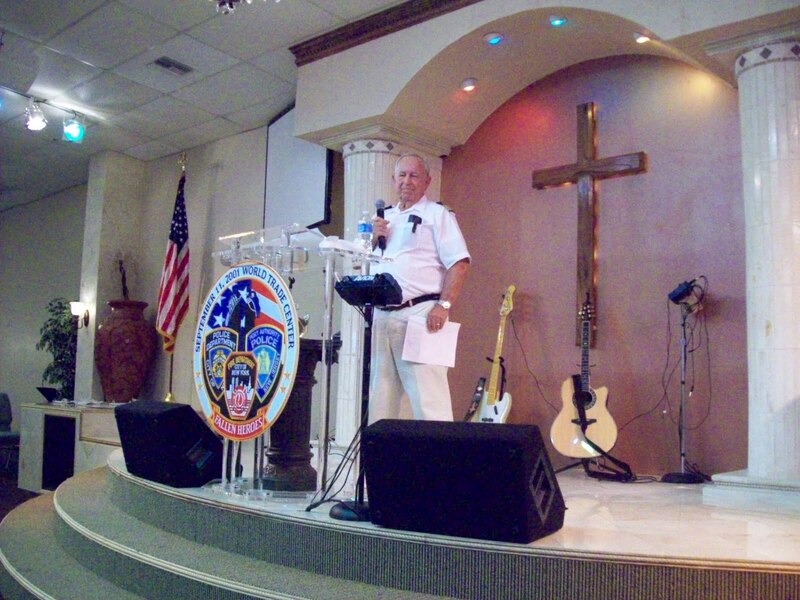 Keynote speakers, Captain Del and Pat Hicks shared their own part of the story concerning God's supernatural, miraculous protection of Del during a plane crash and 40 hours in the frigid waters of the Atlantic. Years of studying, praying and confessing Psalm 91 was their foundation of faith during this crisis and God showed himself faithful during their time of need. 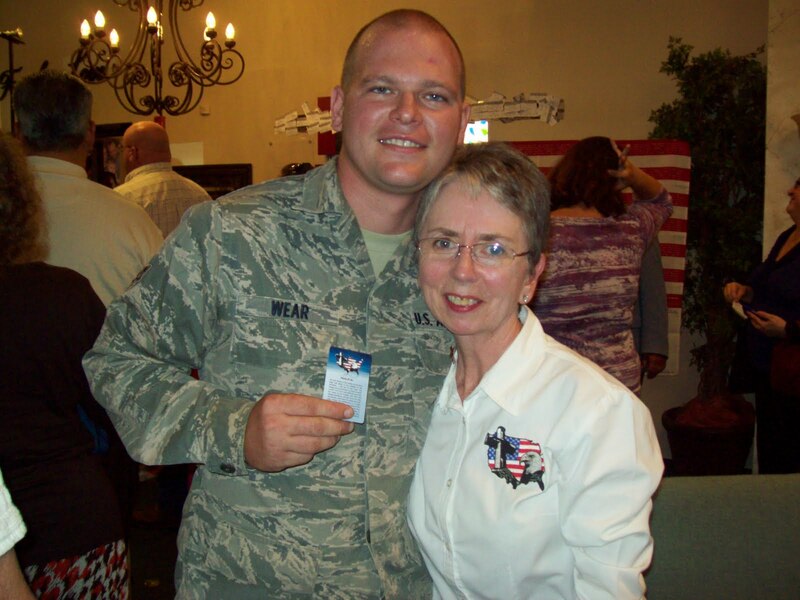 to give a Psalm 91 card to this young man in the Air Force. 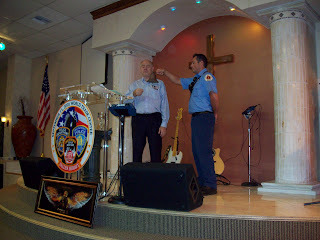 Thank you, Pastors Gerry and Donnelyn Khourie, for the honor and privilege of preaching in your Church, and for your faithful partnership with Operation Safety 91! We appreciate you and your Congregation! 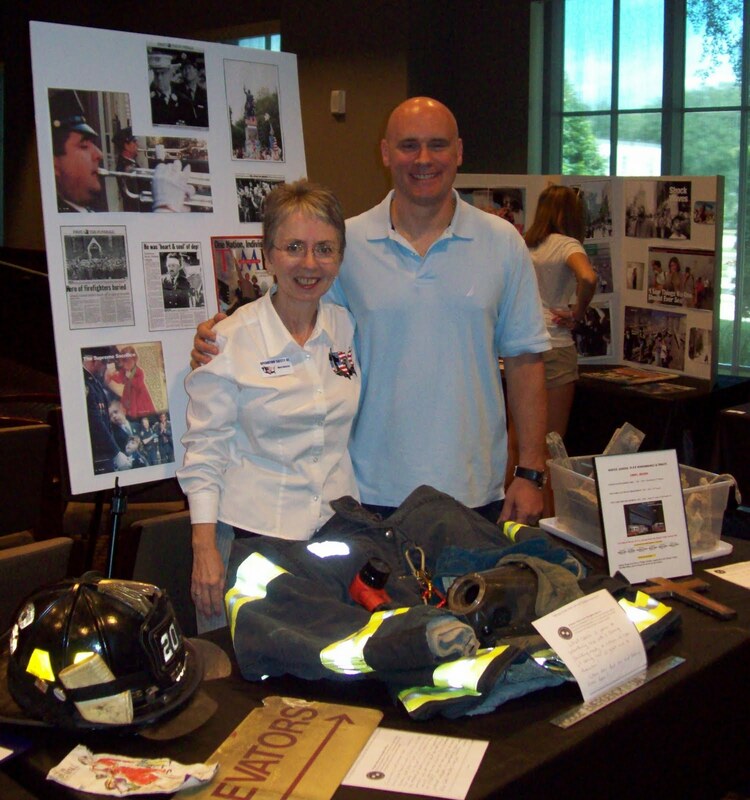 Friend of Operation Safety 91, Windermere Eagle Scout Jeff Cox and Police Explorer Jeffrey Johnson help Mary restock our table at "Winter Garden Remembers 9/11" on Saturday before Ed and Mary's trip to Port St. Lucie, FL for 9/11 Services at Christ Family International Church on 6501 St. James Road. This week at the exhibit at Winter Garden's City Hall the response of the people has been overwhelming. 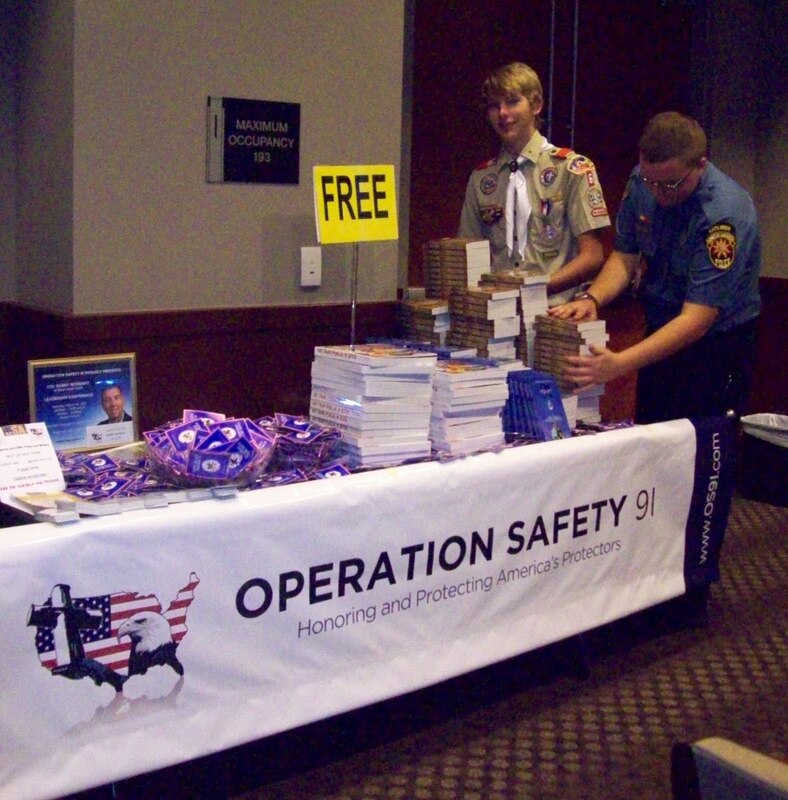 OS91 was restocking books and cards several times daily! 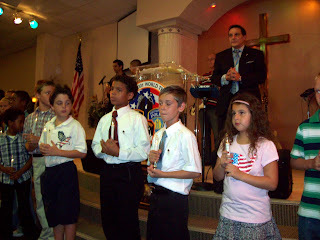 A very good attendance shows that we have not forgotten the Events of 9/11....and young men like Jeff and Jeffrey give us great hope for the future of America! Special thanks to Norman Rein for putting this week long Event together. 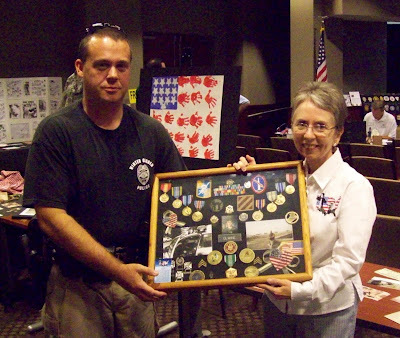 Iraq Veteran Jason Irwine visits "Winter Garden Remembers 9/11"
It was my honor and privilege today to meet Officer Jason Irwine at "Winter Garden Remembers 9/11" being held all this week in the Council Chambers at Winter Garden City Hall. Jason is an Iraq War Veteran and told me a few stories, one of which was about a little Iraqi girl, who, after some momentary shyness and timidity, presented Jason with a piece of flatbread and then gave him a hug. Jason, that day, was extremely homesick for his daughter and was touched at the Providential timing of this encounter! I took the opportunity to give Jason, who had already received a Psalm 91 book a few months back, a Psalm 91 card, which you can see on the bottom corner of his framed medal case. 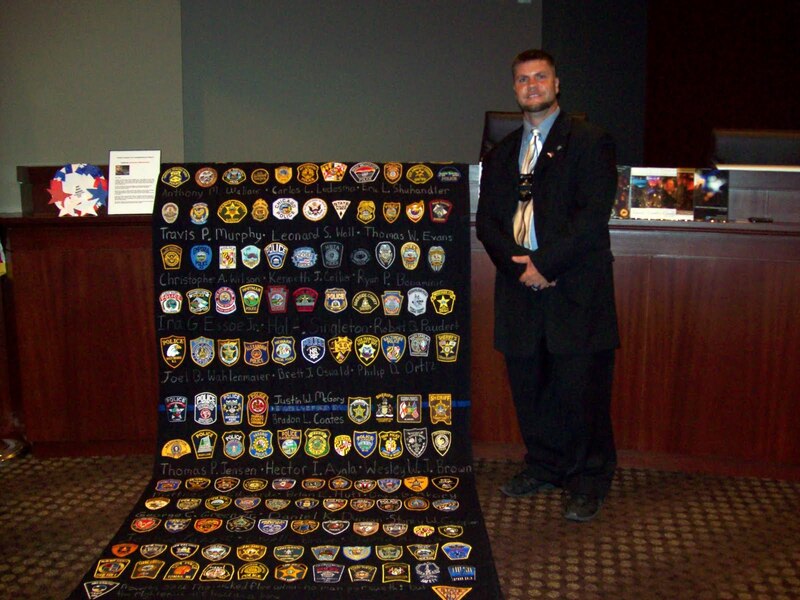 OS91 appreciates you, Officer Jason, for your service then and now! 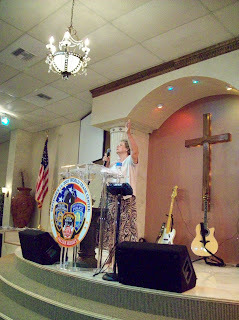 Know that we pray for you and all our Police and Law Enforcement Officers daily! 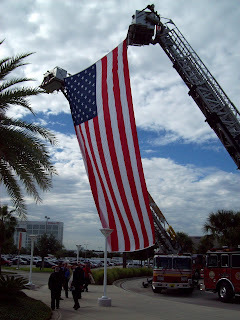 OS91 invited to Patriot Day Breakfast "Honoring American Heroes"
Winter Garden Fire Department Deputy Chief Matt McGrew most graciously invited OS91's Ed and Mary Ganster to join himself and Winter Garden Fire Chief John Williamson for the Patriot Day Breakfast this morning at the Orange County Convention Center in Orlando. What an inspiring Event, "Honoring American Heroes" our very own local Responders, going over and above the call of duty to rescue, protect and defend us. Our most heartfelt Congratulations to all the Honorees as well as our most sincere thanks to all Responders who keep us safe and free. We appreciate you so much! And special thanks for the invitation, Deputy Chief McGrew! 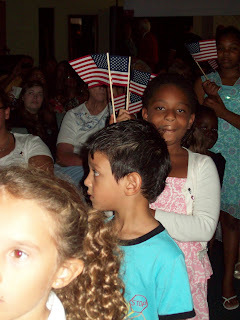 We were truly honored to attend! 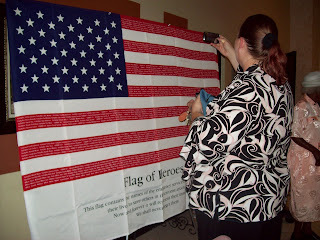 "He will cover us with His feathers and hide us in the shelter of His wings..."
Winter Garden's Remembrance of 9/11 on this 10th Anniversary memorial week began with many patriotic citizens coming today to view the tables lining the walls in Winter Garden's City Hall. This Tribute called "Remembering the Heroes", those whose lives were sacrificed on 9/11/2001, is an exhibit in the Council Chambers which will be running from Monday, 9/5 through Sunday afternoon, 9/11. Former FDNY Jimmy Brown of Ladder 10, Tower 10, of the Twin Towers Fire Station, was interviewed by FOX News this morning in the Council Chambers and told his 9/11 survival story. Jimmy is travelling to NY tomorrow morning accompanied by Winter Garden Battalion Chief Brian Sanders and 2 Winter Garden Police to bring down a 700 lb. 16" flange I-Beam from the Twin Towers which will become a Memorial in the city limits. Also on display are personal thoughts from Americans, civilians and non civilians: poignant, thought provoking, pain filled. This Firefighter shares why he does what he does. Former NYPD, also responding to that tragic call 10 years ago was Marvin Vasqquez, who later went on to be President Bush's personal ambassador to go around the U.S. for 1 year speaking about 9/11. 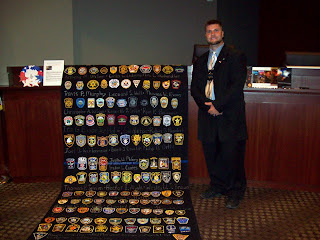 A big Thank You goes to former NYPD Norman Rein, who spearheaded this Exhibit! 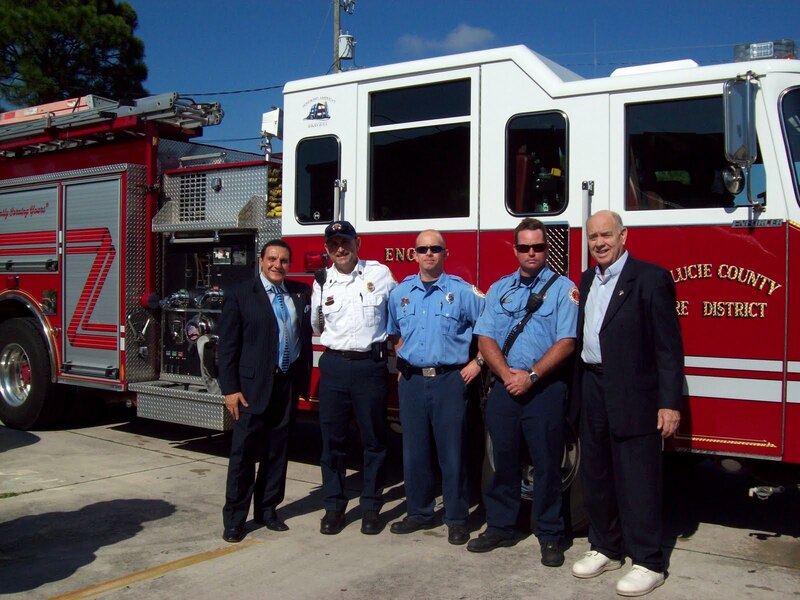 OS91 is honored to be associated with men like Norman, Marvin and Jimmy, part of the tremendous rescue effort at 9/11. "We will never forget!" 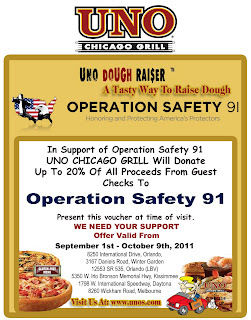 Eat at UNO's and Support Responders and OS91! 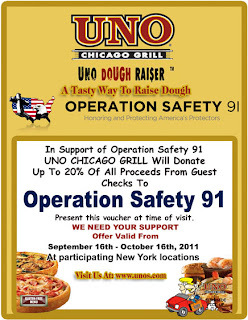 OPERATION SAFETY 91 announces a new partnership with UNO CHICAGO GRILLE a national chain of restaurants with a varied menu of deep dish or thin crust pizza, steaks, chicken, seafood, pasta, salads, desserts (choice of full portion or 1/2 portion), etc., as well as specialty items not found in other restaurants. Also Lunch specials and Kid's Menu. 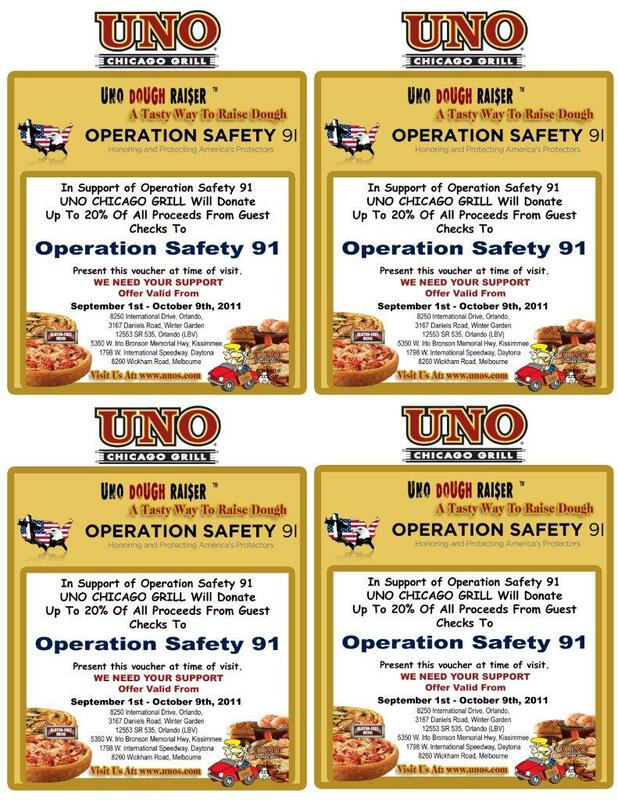 A fundraiser for OS91 called a "DOUGHRAISER" is set for Thursday, 9/1 THRU Sunday, 10/9, the conclusion of Fire Prevention Week. 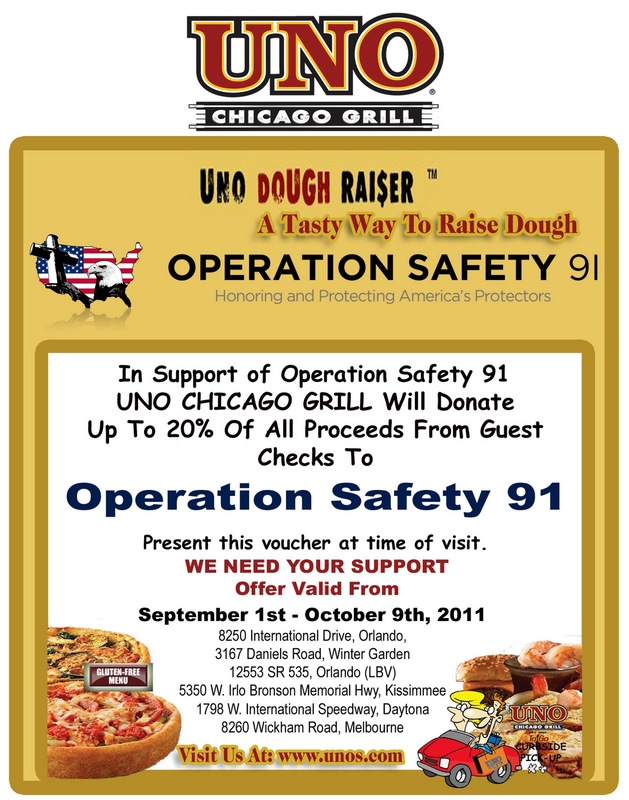 UNO's very much appreciates OS91's mission to Honor and Protect our 1st Responders. 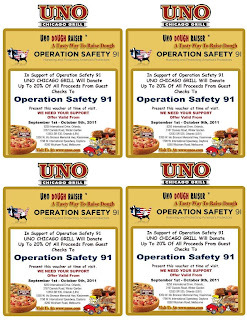 To that end - at ALL 6 Locations listed below - you can present the voucher pictured above, which is good for dine-in, carry-out and commercial delivery, (sorry, no residential delivery) and 20% of your check will be donated to OS91 by UNO's! Our Responders deserve our support. 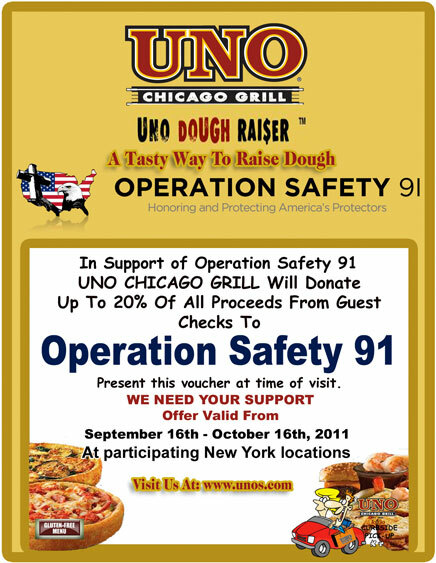 Use this UNO’s voucher between 9/1 and 10/9 to support them! Email this voucher to all your friends! These funds will directly benefit Responders all over the U.S., as well as Iraq and Afghanistan.